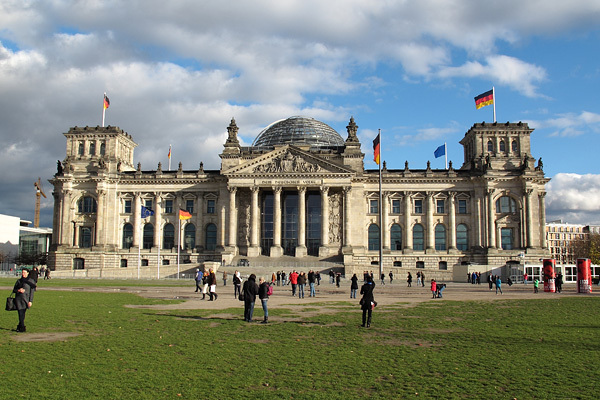 Today most people make a beeline for the spectacular dome and never realize that there are several options for extended visits which include the interior of the main Reichstag building. Thomas and I took a 90-minute Art and Architecture tour of the Reichstag to delve a little further into this amazing piece of German history. I’ll admit that some of the modern art had me rolling my eyes, but the tours offer an incredible opportunity to access parts of the building that are off-limits to most visitors. 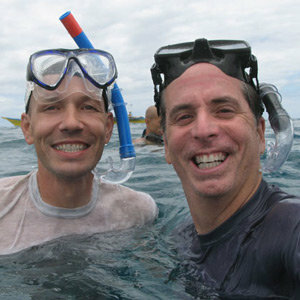 Here’s a tiny sample of what we saw as well as tips on how to take an extended tour. 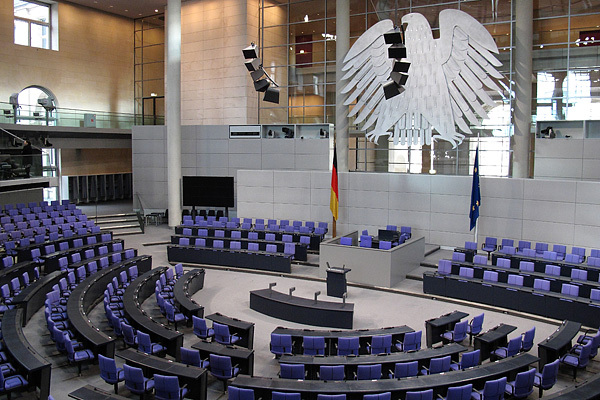 The plenary chamber below the famous Reichstag dome houses the Bundestag, the German equivalent of Congress or Parliament. 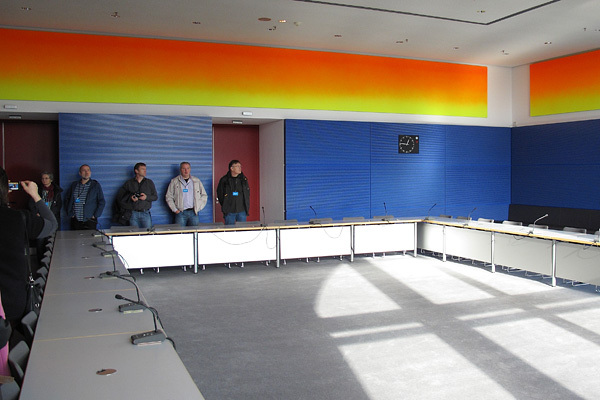 Only visitors on extended tours of the Reichstag get to enjoy the view from below the Reichstag dome. 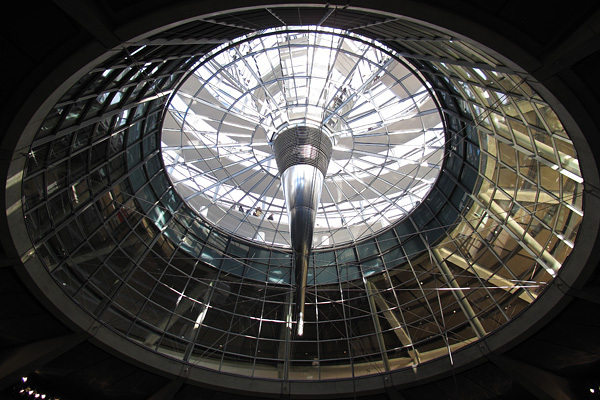 The glass ceiling of the plenary chamber is meant to represent the transparency of the modern German government. 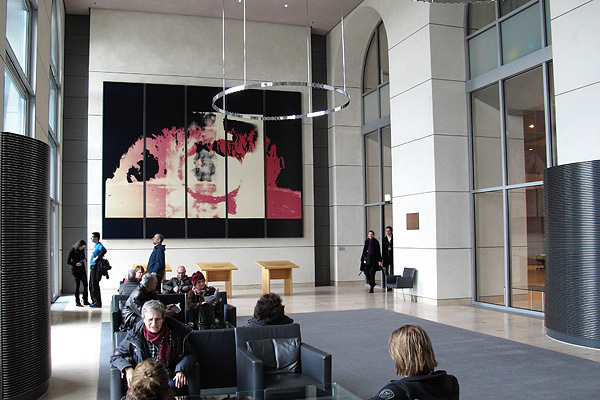 If Katharina Sieverding’s painting at the back of this ground-floor lounge looks a bit like a solar eruption overlying a human spine with a tumorous growth, that’s because it is. It’s part of a memorial to the 96 members of the original Reichstag (parliament) who were murdered by Nazis. A view of the Reichstag roof as you enter the building’s phenomenal dome. 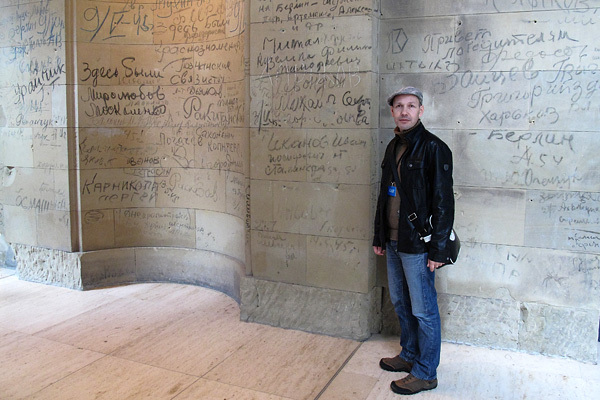 Before approaching the dome, explore the corner towers to discover more Russian graffiti. 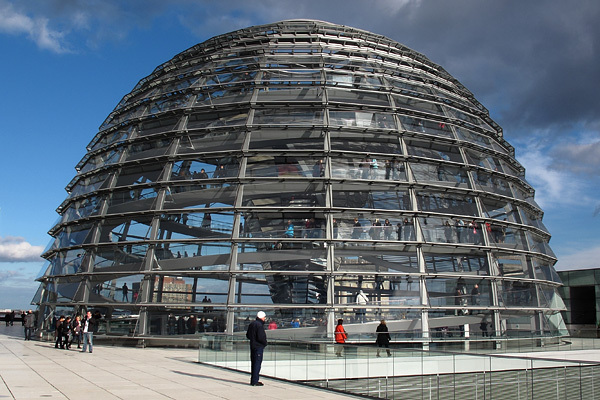 You used to be able to simply go to the Reichstag and visit the dome. Along with the architecture, public accessibility was meant to be part of the ideal of transparency. Unfortunately, the threat of attacks has put those ideals on hold for the time being. 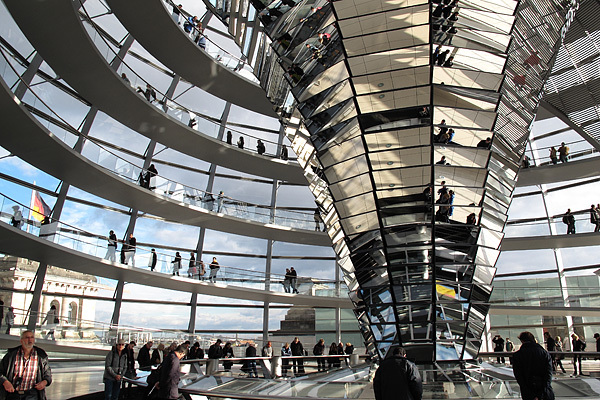 Today, if you want to visit the Reichstag dome, you must pre-register online to book a visiting time. Be warned that at peak times visits to the dome can be booked out for days. If you wish to take an extended tour of the building or attend an event in the plenary chamber, you can book those experiences on the same page; however, tours and events are usually booked out weeks in advance, so plan ahead. I never knew about this extended tour which looks incredible! My only experience visiting a parliament building was in Vienna, and I instantly fell in love with its neo-classical architecture and one of its two chambers which still bare its original Greek-inspired design. Unfortunately the other chamber was bombed during WWII.